According to In Style, shades of gray, scarlet, and yellow are hot this spring. I, however, prefer green and purple, as in fresh English pea green and baby artichoke purple. 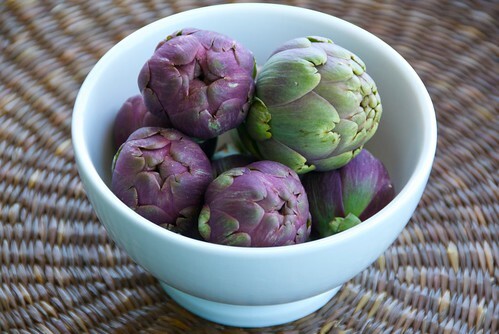 Apparently, so do San Diego's farmers; our farmers' markets have some of the most stylish looking artichokes around -- ranging from petite purple baby artichokes to hefty, celery green Big Heart artichokes. Baby artichokes are delicious in many dishes ranging from risotto and pasta to salads and soups. Paired with Italian Farro or emmer, as in this Farro with Baby Artichokes, Mushrooms, and Peas, baby artichokes are exceptionally stylish. Farro is a wonderfully chewy, nutty flavored whole grain that has been used for over 6,000 years. 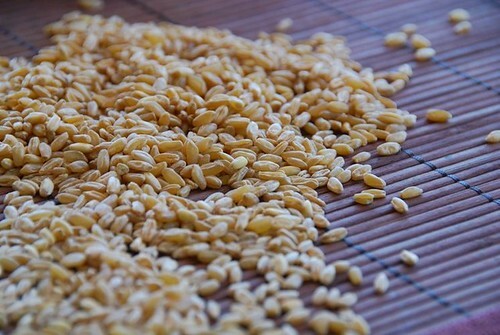 Although used extensively in Italy, where it has been enjoyed since ancient Roman times, farro has only recently gained popularity here in The States. Farro isn't always easy to find in grocery stores. The best place to buy farro is at an Italian market or deli. Otherwise, try organic markets or online sources. Know that farro is expensive: a 15-20 ounce bag ranges from $6-10. Once you taste it, though, you'll understand why it's pricey. Cooked farro is a delicious cross between bulgur and wheat berries -- firm, chewy, nutty, and satisfying. If you can't find farro, then barley or spelt make good substitutes. By the way, if any In Style editors are reading this, don't worry, I'll be donning scarlet shortly, as in rhubarb scarlet. 1. Soak farro in cold water for 30 minutes. Drain. Place in medium pot, and cover with 3-4 inches of water. Bring to a boil. Lower to a rolling boiling, and cook for about 20 minutes, or until tender. Cooked farro should be firm and chewy but not hard. Drain any remaining water, and place in a bowl. 2. Meanwhile, fill a medium sized pot with water and the juice of 1 lemon (which prevents the artichokes from oxidizing, or turning brown), and bring to a boil. Remove any tough or damaged outer leaves from the artichokes. Trim the tops and the bottoms, and slice into quarters. Boil for 3-4 minutes, or until just tender when pierced with a fork. Drain and plunge in a bowl of ice water to stop the cooking process. 3. In a large skillet over medium heat, add olive oil. Add mushrooms and shallot, and saute 5-7 minutes, or until mushrooms are lightly browned. Add wine. Allow alcohol to burn off for about 5 minutes. Add the cooked farro, beans, broth, salt, and red pepper flakes. Stir well, and cook 3-4 minutes. Stir in peas and lemon juice. Cook for 2 minutes, or just until peas begin to soften. Remove from heat. Stir in parsley, cheese, and pistachios. Drizzle servings with extra virgin olive oil. So pretty! Even the colors feel like spring. I have never had farro, but I hear it is delicous! All of the different textures and flavors in this dish compliment each other so well! I love your use of so many seasonal ingredients. Splendid! I love farro AND baby artichokes -- and now I am dying to try this. So happy you posted this because I am always looking for new ways to cook farro. The artichokes are beautiful. Perfect recipe for spring. Those are just gorgeous artichokes. I love your photos! jessica-Oh, you must try it. Soon! kalyn-I know what you mean. consumblejoy-thanks! I just added a post to your recipe too. Sounds simply delicious! ramblingtart-They sing spring to me! What a gorgeous color in these artichokes and what a wonderful salad! I love those baby artichokes! I grew artichokes once and was thrilled with the little guys. I gave up, though, when insects ate more than we did. Boo on bugs, I say! This is exactly what I need to be eating. Not the vanilla shake I just downed. Thanks for this! I have to pass on the farro (gluten), although this deal sounds delicious! BUT, I must comment on how gorgeous your photograph is. The colors are amazing. Beautifully done, Susan! The post is lovely food for the eyes, and the recipe seems a lovely Spring dish for the tummy. This is a feast for the eyes almost too pretty to eat. How did you ever bring yourself to cook the beautiful artichokes? i'm still trying to get my hands on farro, as it's tricky to find around here. but i love it so! beautiful artichokes! Perfect Spring dish! The baby artichokes are gorgeous! Those are some gorgeous baby artichokes (purple is my favorite color, and I go wild for purple-hued veggies!) I've been looking for baby artichokes lately and finally ran into some the other day, but they are not nearly as pretty. I am just excited to have found them though, nevermind purple ones! Great photos. That first photo is particularly stunning! nicely done! i love these ingredients... artichokes, mushrooms, and peas go well together! i just made a spinach and artichoke dip with king crab meat on my blog! yay to artichokes! I have farro in the cupboard and just saw beautiful artichokes at the market and thought to myself, "when am I am going to use them"...thank you for giving me a reason to go back to the market for the artichokes and to use my farro! I love your blog Susan! Thank goodness for the great Italian markets in Boston and Providence. Farro is easy to find here. I love cooking with farro this time of year when the evenings are still a bit chilly. Farro has a nice warmth to it. Nice blend for spring! Big fan of farro, and pasta made from the flour is really special. And for readers who can't find farro (whis is NOT spelt!) locally, both the grain and the flour are available online. Just looking at all that beautiful spring green is pumping my veins full of positive energy to drive out the malaise of, uh, lacking vegetables, haha. I want a bowl!! I just came across your blog, and this dish looks incredible. I've been looking for new ways to make whole grains like barley and quinoa, so this is a perfect alternative. I've also been looking for ways to utilize artichokes, as they are such a great spring veggie. Thanks for this idea and I'll let you know when I try it! I have never made farro, but anything with artichokes has got to be great!! Ooh... This is SO up my alley. Farro is my favorite grain (I'm actually beginning to prefer it to risotto which makes me worry a little;) This looks divine - the essence of spring in a bowl. Mmm, looks delicious, I dont know if I've cooked with farro, I've tried quinoa, barley, bulgar, and a bunch of others so I must look out for it next time I'm shopping! Purple and green are dear to my heart too, suffragette colours and also team in training, I'll be riding my bike for them soon in the Rock and Roll Marathon! Was great to meet you saturday!